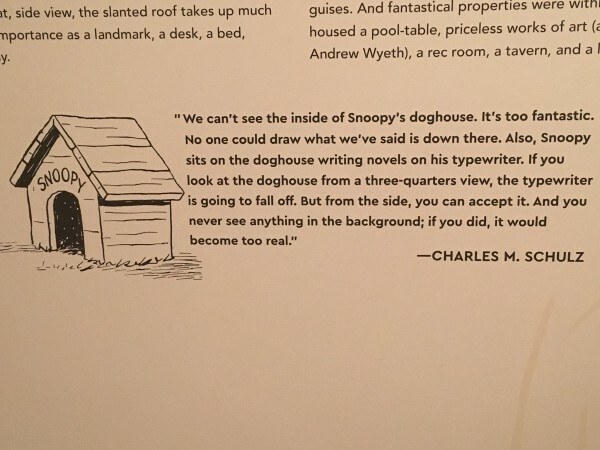 I have been very fortunate in that twice last month I was able to attend major exhibitions about the work of Charles M. Schulz, one in London and one in California. 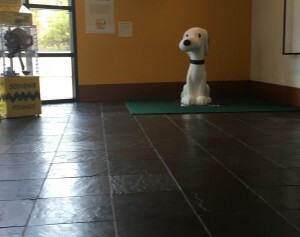 The Charles M. Schulz Museum in Santa Rosa, Cailfornia, ia obviously Snoopy Central. 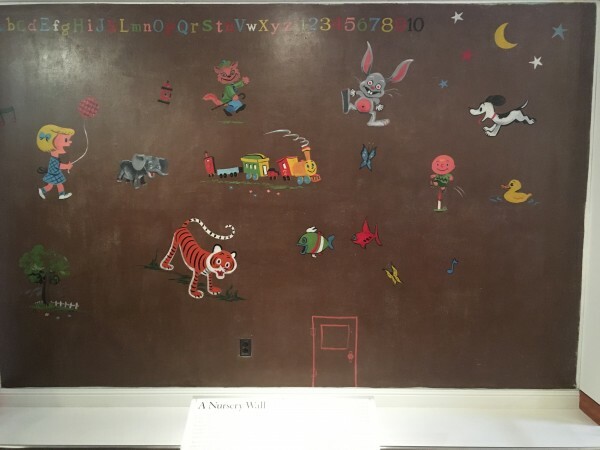 The permanent exhibition consists only of a number of artworks inspired by the Peanuts characters, and recreation of Schulz’s writing desk, and the wall of the nursery that he painted for his children. 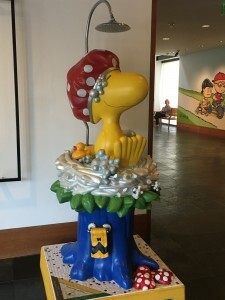 Three galleries have rotating displays of Peanuts or Schulz material. 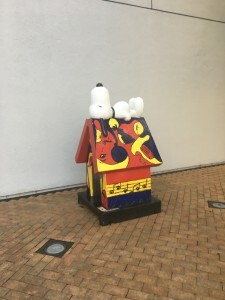 At the moment two of them look at different aspects of Snoopy (and the other dogs in Schulz’s life), and the third at Charlie Brown’s sister Sally. 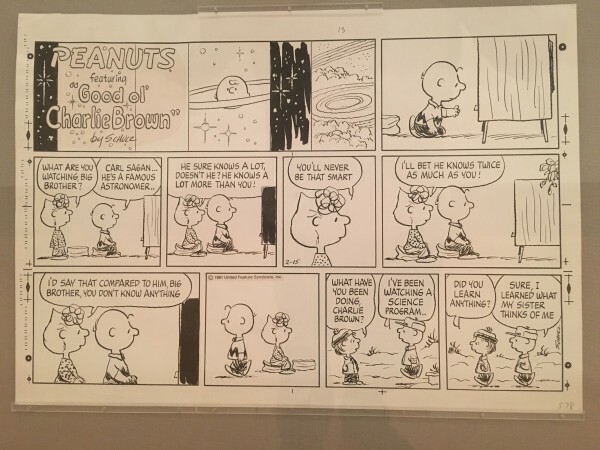 The displays include hundreds of original strips as Schulz drew them. 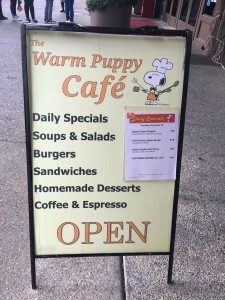 I went with a fannish group, and we started with lunch at the Warm Puppy Cafe which actually is part of the ice rink that Schulz also owned. Here James Bacon, Chair of next year’s Worldcon, takes advice from Esther McCallum-Stewart, the Chair of the bid for a UK Worldcon in 2024. 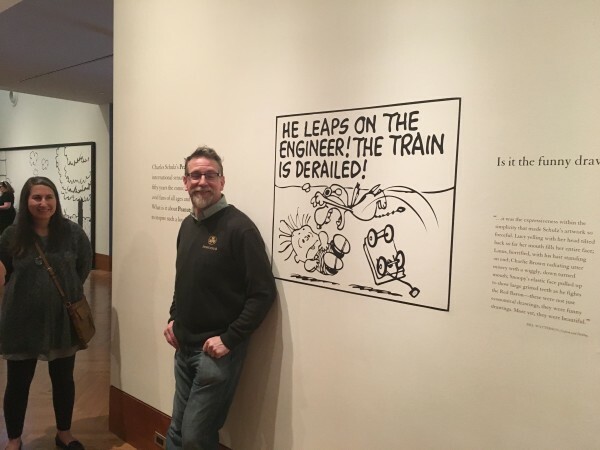 James is actually a train driver by profession. 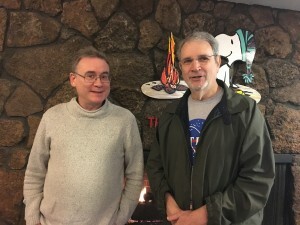 Another in our group was writer David Gerrold, here with me in the Warm Puppy cafe and also at the start of our docent-led tour of the museum (the docent on the right; in between is a photo of Schulz taken by the actor Roddy MacDowell). 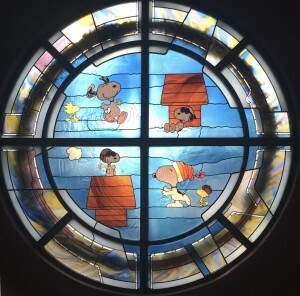 And there is also a split-level shop with more exhibits on the upper floor and a stained glass window. 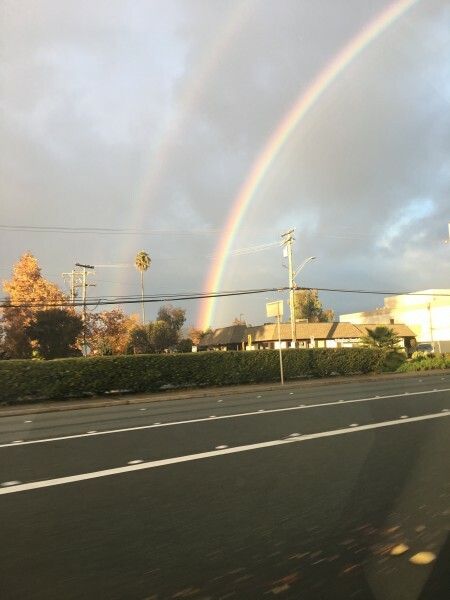 I should say also that it was one of those days when the northern California sun and rain interacted to produce some spectacular rainbows. 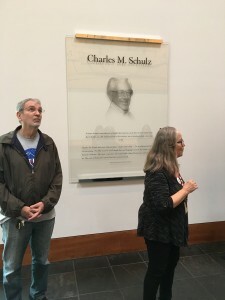 Dare I say it, it’s actually a much more interesting exhibition than the current displays in Santa Rosa. 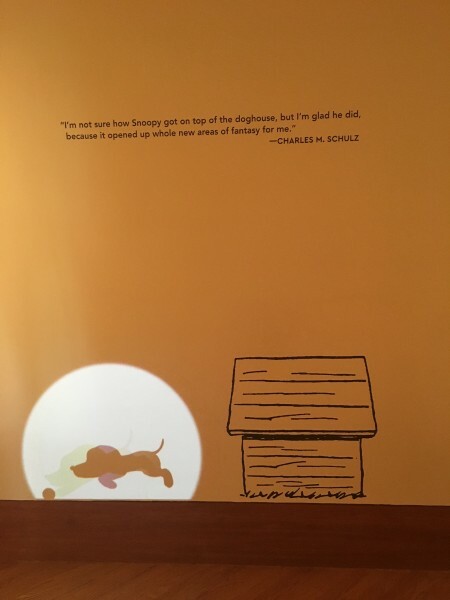 The exhibits go a lot deeper into the story of Schulz’s life and how his experiences played out into the strips (Snoopy’s war stories owe a certain amount to his creator’s WW2 career; there was a real Charlie Brown and a real little red-haired girl). 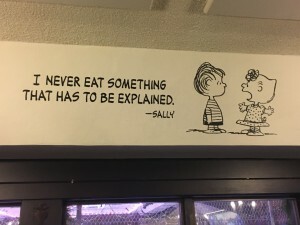 I devoured the strips as a very young reader; I am not a particular fan of the various TV movies. 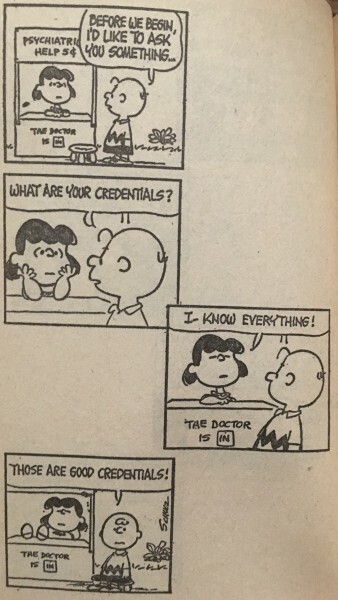 But I had not appreciated how politically attuned they were. The story of Franklin’s introduction has been well covered; the relationship between Peppermint Patty and Marcie is impossible to read now without speculating that there is a deliberate lesbian subtext. 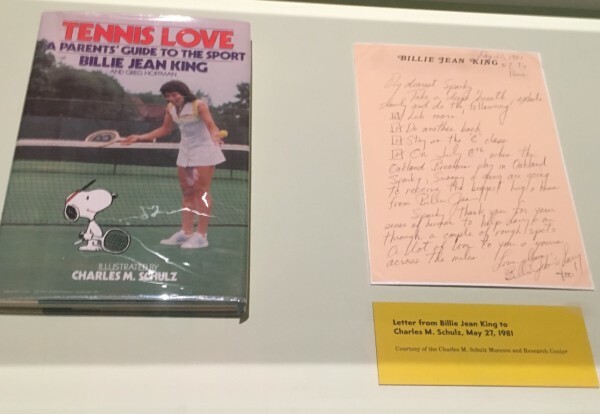 Billie-Jean King was not only a fan but a friend. 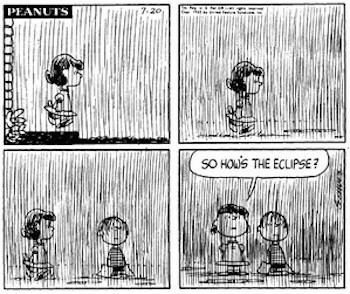 And some remain eternally relevant. 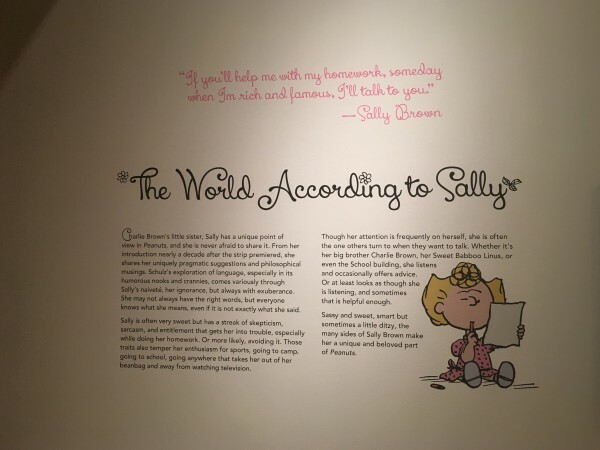 In summary, I found the London exhibition very thought-provoking, while the Santa Rosa museum is just plain fun. 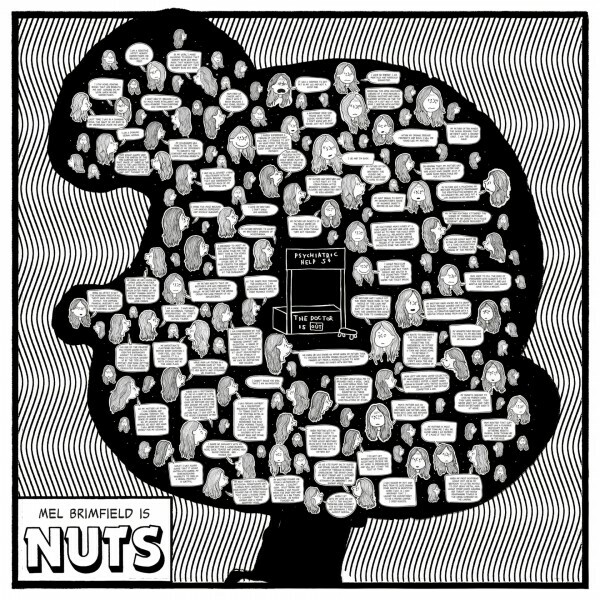 I'm not a particularly big Peanuts fan but I still find the strip funny and charming (especially Snoopy vs. the Red Baron) and I do intend to get myself to Somerset House. 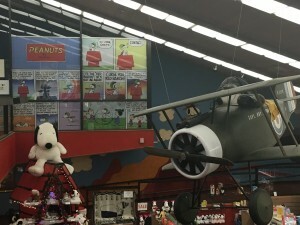 Is Santa Rosa also where Charles M. Schulz Airport is? 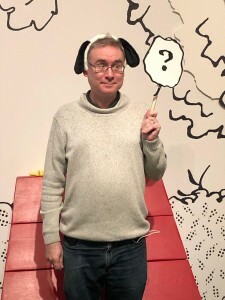 I'd very much like to go there. 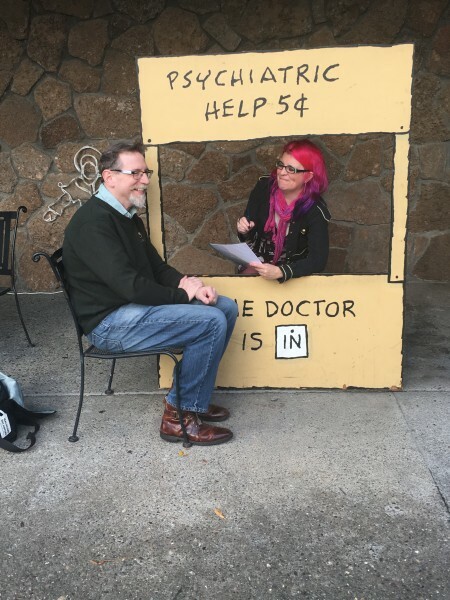 Thanks - next time I'm in California (whenever that is) I will make an effort to get there!